We’re past the first weekend in October – the dreaded daylight savings change. One clock I have has made this easy, it has a DST button which advances the one hour. Of course, we have forgotten how to change the time other than that. Currently it’s 10 mins ahead and accelerating. Speaking of forgetting, Amnesia Blues Band is coming to Geelong. Amnesia Blues Band are from Gippsland and have been playing blues originals and covers together since early 2013. Their music comes from the tradition of the early bluesmen and mid-20th century blues: Muddy Waters, Big Bill Broonzy, Elmore James, Sonny Boy Williamson and so on. The band’s name stems from the fact that the boys aren’t getting any younger, so remembering songs and where they left band members can be a bit of a struggle! Paul, their lead singer, had a significant ‘heart scare’ a few years ago and he decided that he wasn’t going to be around forever, so he may as well start playing music again. A chance conversation between Paul and Stuart Anderson veered onto the topic of the blues and Paul mentioned that he was in a band who were looking for a drummer. Stuart mentioned that he was a drummer looking for a band. A deal was struck. The five-piece band features Paul “Buck” Buchanan (acoustic guitar, vocals), Stuart Anderson (drums), Sandy Clark (lead guitar), Ning Hopkins (lead guitar), Darryl Kerr (bass guitar) and either Dennis “Salty” Trevarthen or Barry Walker on harmonica. Paul is the main songwriter in the band. He’d had several decades away from music, but is now belting it out as the lead singer of Amnesia Blues Band. Stuart has been playing drums most of his life, but as one of the younger band members, his amnesia is not as advanced, so his role is to remember ‘where that thing is’ and ‘who that guy is.’ Stu is recognised by his collection of home-made drums and Paisley shirts. Ning and Sandy have been playing together for many years and can weave a certain kind of magic with their duelling guitars. 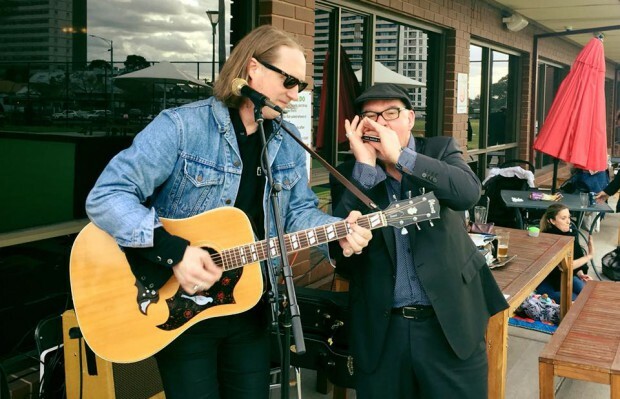 For an urban edge, Salty Dog brings the grit with his impressionistic blues harp and unauthorised percussion. At other times, Barry displays a fine selection of jandals and vintage harp mics to go with the growl. New in the engine room for 2018, Darryl joins us from Gippsland’s Blues Lizards to hold it down rock-steady in the rhythm department. They released their debut album, “We Still Remember” in 2016, featuring eight original songs and four ‘not-so-obvious’ covers. In September 2016 the band was voted MBAS Vic/Tas Band of The Year and were finalists in the MBAS International Blues Challenge in 2016, 2017 & 2018. Please write down, right now that Amnesia strikes at Sleepy Hollow on October 28th. See you there, but don’t expect me to remember you. Sleepy Hollow has started releasing band details for their Bluestone Festival over New Year’s Eve, so it’s time to start pulling your camping gear out and checking their website for tickets.